KIEV, Ukraine -- In June 2015, Ukrainian President Petro Poroshenko famously requested exactly 1,240 Javelin missiles—one for every former Soviet nuclear warhead that Ukraine voluntarily decommissioned in the 1990s. The former Soviet state was ruing its lack of deterrence after Russian tanks and artillery intervened in on behalf of a separatist uprising in eastern Ukraine. The infrared-guided Javelin is a fire-and-forget portable antitank weapon whose export is strictly controlled by the United States. Finally, in December 2017, the State Department announced Poroshenko would receive his missiles for Christmas—or at least a fraction of his request: just 220 Javelin missiles and thirty-five launch units. This is not enough to meet Ukraine’s antitank needs. But analysts have already argued that it would be more cost-effective to help Kiev domestically manufacture its own missiles instead. Ukraine was a major industrial center for the Soviet war machine, and much of that arms industry remains—if not necessarily in the best of shape. 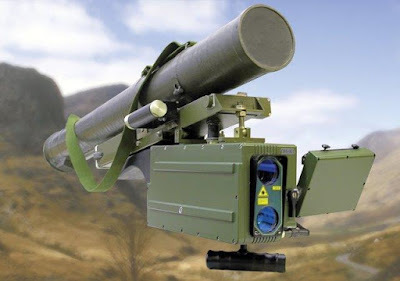 In particular, Ukraine is producing two new families of antitank missiles which might allow it to counter new Russian tanks at much lower cost, and with fewer strings attached, than the Javelin. Currently, the Minsk agreement forbids the deployment of tanks, artillery and heavy weapons of over one-hundred-millimeter caliber to the frontline. Since late 2015, this has caused a steep, but not total, decline in the combat use of armored vehicles. However, if one side were to intentionally break the agreement by massing armor for an offensive, they could overrun surprised defenders lacking heavy weapons of their own. For this reason, both sides have continued to deploy long-range antitank guided missiles (ATGMs) to the frontline, even though many are above hundred-millimeter caliber and thus violate the agreement. The Ukrainian military entered the conflict with ample stocks of older Soviet-era antitank guided-missile designs, including the AT-4 Spigot, the AT-5 Konkurs and the lighter AT-7 Metis. However, improper storage and old electronics meant that as many as one-third failed shortly after launch. Furthermore, the missiles that weren’t duds struggled to defeat the Explosive Reactive Armor (ERA) on Russian tanks, which detonates explosive bricks to trip the shaped charges of incoming missiles before they can strike for maximum penetration. New Russian tanks, such as the T-72B3 and the T-90A, are also equipped with “soft” Active Protection Systems and Laser Warning Receivers. The latter can detect when a vehicle is being painted by a laser designator and possibly determine the position of the missile system; the former seeks to obscure the target vehicle or disrupt the incoming missile’s guidance systems. According to one report, Ukrainian gunners were repeatedly frustrated when their missiles appeared to go haywire as they approached Russian tanks. Of Ukraine’s domestically-built missiles, the light Corsar missile is the newest; the first fifty were delivered to the Ukrainian armed forces in August 2017. It has been nicknamed the Ukrainian Javelin because it weighs only thirty-two pounds loaded, and can be fired from the shoulder as well as mounted on a tripod for additional stability. The system is semiautomatically guided (SACLOS), which means the operator trains a stealthy low-energy laser on a target up to 2.5 kilometers away using an 8x sight until the 107-millimeter missile strikes its target no more than twelve seconds after launch. Supposedly the system is agile enough to attack hovering helicopters, drones and speed boats, as well as armored vehicles. The Corsar can fire a fragmentation warhead, which can still penetrate fifty millimeters of armor, a thermobaric warhead for striking enclosed fortified targets, and an RK-3K antitank munition, which can penetrate the equivalent of 550 millimeters of Rolled Homogeneous Armor (RHA) after bypassing ERA. The Corsar launch units are not exactly cheap, at $125,000 each, but the missiles cost only $20,000, one-quarter the price of a Javelin missile. Though the Corsar exhibits good performance and range relative to its size, and could prove effective against infantry fighting vehicles and older tanks; it does not appear to boast sufficient penetration to defeat the frontal armor of the latest main battle tanks. The heavier (seventy-pound) Stugna-P ATGM system, which can fire 130- or 152-millimeter missiles, would tackle such tougher beasts. This is a domestic variant of the Skif (“Scythian”) missile codeveloped with Belarus for export. The Stugna-P is manned by a crew of three and mounted on a tripod, which can be remotely controlled up to fifty meters via a wire, allowing the operators to remain safely out of the line of sight. The firer can use both optical and thermal imagers to acquire a target up to five kilometers away, or three kilometers at night. The Stugna-P uses a tandem charge to defeat reactive armor, just like the Corsar, and is additionally is designed to fly towards its target without activating its laser guidance system until the very last moment, so as to avoid detection by laser warning receivers. Unlike Western ATGMs, the Stugna-P can function in temperatures as low as –40 Celsius. The Stugna-P is variously described as a semi-automatically guided system, like the Corsar, or a fire-and-forget weapon like the Javelin, which does not require operator guidance after firing. The explanation appears to be that there are both manual and automatic firing modes; the operator can attempt to avoid detection by manually entering the range instead of using a laser rangefinder. Upon launch, the missile rises up to ten meters in altitude after launch before descending on its targets in its terminal phase. However, this is a shallower trajectory than that of the Javelin missile, and the manufacturer does not claim it will necessarily hit the thin top armor of a tank. Nonetheless, the basic RK-2S missile of the Stugna-P is described as penetrating eight-hundred-millimeter RHA, which may or may not work against newer tanks, depending on how effective upgraded reactive armor proves versus tandem charges. There is also a 152-millimeter RK-2M missile, which can penetrate 1,100 millimeters, which seems a surer counter against top-line main battle tanks, but it does not appear that any RK-2Ms have been ordered. The first Stugna-Ps were received by the Ukrainian military back in 2011, but production has remained slow. In July 2014, only ten Stugna-Ps and seventy missiles were rushed to paratrooper units at the forefront of the Ukrainian war effort against Russian-backed separatists. They were used in combat in the sieges of Luhansk and Donetsk International Airports—in fact, a remotely deployed Stugna was photographed on the control tower of the former. However, some Ukrainian accounts claim the Stugnas at Luhansk were ineffective when they were attacked on August 31 by a platoon- or company-sized unit of T-90A tanks. The missiles apparently diverted off target due to the vehicles’ Shtora active-protection systems, which disrupts laser-guided weapons. The paratroopers defending the airport were forced to fall back on short-range unguided rockets, but did not knock out any of the T-90s. The T-90, however, has played a very limited role in the conflict overall, compared to older T-64 tanks and upgraded T-72s. Deployment of the Stugna-P continues to ramp up slowly. Thirty more launchers and five hundred more missiles were delivered in 2015, with an additional three hundred launchers dispatched in 2017. The Ukrainian National Guard also has Stugna-Ps mounted on Moto Tracker 800 ATVs, which resemble missile-toting golf carts. Ukraine also has deployed the Barrier missile, a vehicle-mounted version of the Skif used on domestically manufactured BTR-3 and -4 armored personnel carriers, as well as upgraded BMP-1 fighting vehicles. A Barrier-B variant with a range of 7.5 kilometers also exists for use on Mi-24 Hind attack helicopters. The Barrier has begun to see use in combat in the latter years of the Ukrainian civil war. Both the Corsar and Stugna-P are modern and capable antitank systems, even if neither has quite the capabilities of a Javelin. Realistically, ATGMs are being employed more frequently against lighter armored vehicles and personnel targets, rather than top-line tanks with state-of-the-art defenses, so reliability, accuracy and crew survivability may be of greater importance. The home-built missiles may end up being a more cost-effective choice for the Ukrainian military than the Javelins—if Kiev can continue to modernize its forces and improve industrial performance.